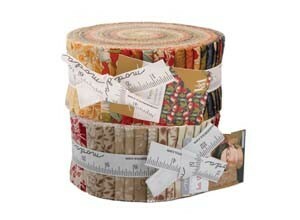 Exciting new Jelly Rolls each month. 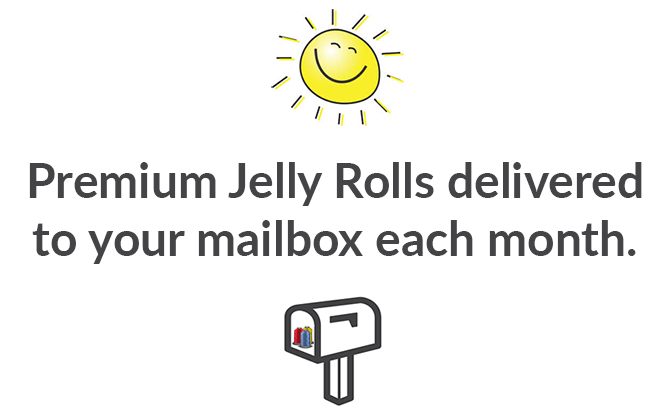 Get the best selection of Jelly Rolls each month. Build up your stash with the best! Save big when you subscribe to our monthly plans, and skip trips to the store. More time to quilt and sew! No commitment and easy to cancel when you want to. We make it easy to cancel, skip a month, subscribe again, or even try a new club instead! Choose the style that suits you. 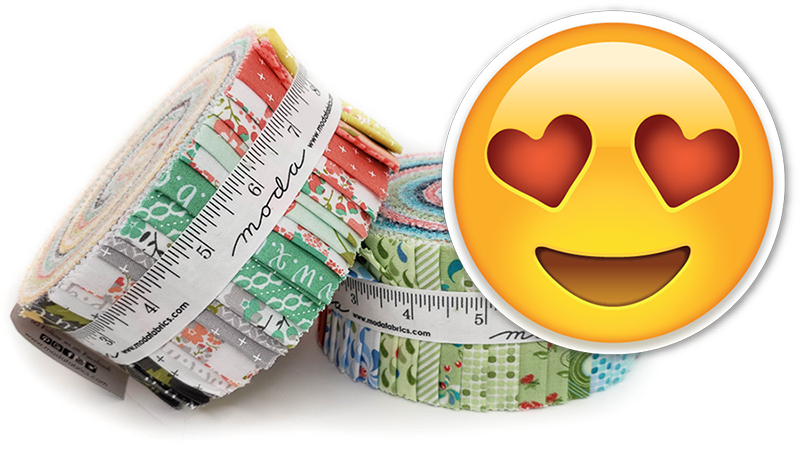 Each month we send only the BEST selection of Modern & Contemporary Jelly Rolls, from top Moda designers such as Zen Chic, Bonnie & Camille, Lella Boutique, Vanessa Christenson, Gingiber, April Rosenthal and more! 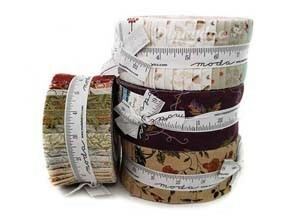 Each month we send only the BEST selection of Traditional Jelly Rolls, from top Moda designers such as French General, Holly Taylor, Debbie Maddy, Kansas Troubles, Primitive Gatherings and more! Next club shipment on April 15th. Don't miss out! Sorry, this offer has now expired. Delicious fabric choices!! Beautiful fabrics! I have only received one month's bundle so far, but I like what I see. 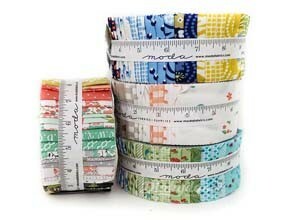 The fabrics in this bundle coordinated nicely and are of a very nice quality. This is an affordable luxury service - thank you! :D.
A bit of sunshine every month! What a delight to get a carefully curated package in the mail each month! I am new to quilting and not all that adventurous when it comes to choosing fabric in my own, so receiving a set of coordinating fabrics each month helps me expand my stash in new directions. The best mail in your mail box keeps you inspired to create new and creative items. I love receiving my Fat Quarter Club subscription every month. No complaints, great selections of fabrics, it's really rounding out my stash with new cute prints that I might not have thought to buy! A++++! Absolutely love receiving perfectly coordinated fat quarters every month. I am useless at deciding which fabrics go well together and with this subscription I don’t even have to think about it. Top quality quilting cottons. I have been a member for 6-7 months and I have never been disappointed by what I have received. Beautiful fabrics delivered promptly every month! High quality fabrics to work with too. Thank you Dinkydoo Fabrics! Being so far North (NWT) and not a quilt store close by, it is wickedly amazing to have product delivered right to your door!! I love the 2 packs I've received already and can't wait for more! Q: *How do I get my 13th month for FREE? A: You will simply not be charged on your 13th month. Easy! 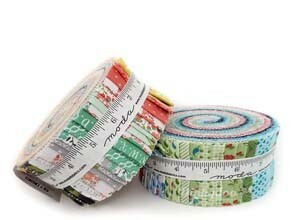 Q: If I subscribe to the 2 Jelly Roll or 4 Jelly Roll club, do I get ALL the Jelly Rolls free on my 13th month? Q: Will you send me brand new collections, or old stuff you can't sell? 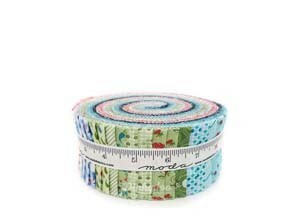 A: All Jelly Rolls will be newer, released within the last 2-12 months, and hand-picked to be the best of the best. No old, discounted fabric, or fabric we can't sell - ever. Q: Do I have to pay right away? A: Yes, you will pay up front for your first shipment, and on the 15th day of each month following, unless you cancel your membership. Q: When will my fabric be sent out? A: Club fabric is sent out around the 15th of each month. A: Yes. You can cancel your current club, skip a month, or even sign up to a new club easily within your membership area. It's very easy to do. Simply log into your account and click Manage Subscriptions. Q: Can I choose between Modern & Contemporary and Traditional? A: Yes. We offer both styles! 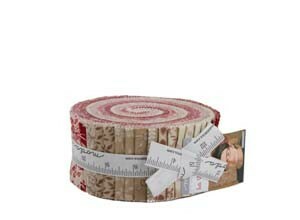 Q: If I don't like my Jelly Roll, can I return it? A: Yes. We want you to be happy with the fabric you get. The fabric must be unwrapped and in sellable condition, and you must pay return shipping back to us, or bring it in-store for a full refund. Q: Do I earn my regular reward points on my club memberships? A: Yes! As an extra BONUS, you earn Dinkydoo Rewards with your club purchase each month. Q: I don't like surprises. Can I choose which designers or collections are sent? A: Unfortunately, no. Part of the fun of a fabric club is the element of surprise on what we pick and what will be sent. If surprises aren't for you, you can browse our in-stock and future pre-cuts, and order your favourites! A: All Charm Packs will be newer, released within the last 2-12 months, and hand-picked to be the best of the best. No old, discounted fabric, or fabric we can't sell - ever. A: Yes. We offer both styles, and even an option to mix and match! Q: If I don't like my Charm Pack, can I return it? Q: How much is shipping? If I subscribe to multiple clubs, can I get FREE Shipping? A: Shipping is $9.99 in Canada and $12.99 in the U.S. If the value of your club memberships exceeds $149 CAD, we will ship multiple clubs together at the same time, and waive your shipping fees. If you have multiple clubs and the value is under $149 CAD we will waive one of the shipping fees. Email us at club@dinkydoo.com to set this up. Q: Can I use gift cards, rewards points or coupons towards the club? A: Unfortunately not, as the subscription service uses an separate secure checkout which doesn't allow for additional discounts. Q: I'm local. Can you waive the shipping charge so I can pick up in-store? A: Yes! Use code PICKUP at checkout. We will notify you when your club is ready. Q: If I cancel my membership and rejoin later, do the months I received earlier count towards the FREE 13th month shipment? A: Unfortunately, no. You will start fresh and receive your 13th month FREE when you complete 12 paid and uninterrupted months in a row.